In the News - Mike Clum Auctions Inc.
Kathy Clum 70 of Rushville, Ohio passed away Sunday, February 5, 2017 at OSU Wexner Medical Center. She was co-owner and business manager of Mike Clum Auction Gallery, Inc. and a member of Zion Reformed U.C.C. of Thornville, Ohio. Kathy is survived by her husband, of 51 years, Mike Clum; daughter, Laura (Larry) Watson of Rushville, Ohio; son, John (Jodi) Clum of Alexandria, Ohio; grandchildren, Bryan Watson of Lancaster, Ohio, Chase Watson of Rushville, Ohio, Courtany Brooke Blevins of Canal Winchester, Ohio, Emma Grace Clum and Ava Faith Clum both of Alexandria, Ohio; mother, Gloria Alvis of Newark, Ohio; brothers, Mike (Linda) Alvis of Thornville, Ohio and Rev. Rick (Julie) Alvis of Indianapolis, Indiana; five nieces and nephews. She was preceded in death by her father, Jack Alvis and father-in-law and mother-in-law, John and Jane Clum. Memorial gifts may be given to the Zion Reformed U.C.C. in her memory for the restoration of a mural that gave her strength and comfort. To send an online condolence, and sign the guestbook, please visit www.funeralhome.com. Last Wednesday we rushed mom to the ER to find that her lymphoma had returned. My heart sank. Tears began to run down my cheeks. All I could think about was all she had gone through 8 years ago and what she was in for once again. Last Thursday morning was much different than the one 8 years ago. It was hopeful. I felt like this would be a walk in the park. She looked a little jaundiced, but she was upbeat. The doctors knew this was very treatable. They began to do routine testing; MRI, CAT, PET scans. That’s when they found a malignant mass between her liver and stomach that was pushing against her spine, causing severe back pain. They needed a biopsy of this mass so that an appropriate chemo treatment could be coordinated. That’s when things started falling apart. While having the biopsy, she developed aspiration pneumonia. As a result, they had to put her on a ventilator to help her breathe. Her blood pressure dropped. The doctors asked for a meeting with the family and explained to us that her kidneys were beginning to fail. She needed dialysis. By now, she was non-communicable. Heavily sedated. But, we were not without hope. We still were optimistic this was just a little detour. But then by Sunday morning, her blood pressure was bottoming out as another problem developed. Her heart was in atrial fibrillation. She was medicated for that, but the medication was counteracting the blood pressure medicine. So the medical team asked for another meeting with the family. This time, they indicated it was just a matter of hours that she would be with us. Her major organs were shutting down. It was decided to remove the mechanisms keeping her alive and let her pass. Shortly after detaching everything, she peacefully slipped into the presence of Jesus. So this week, we are planning a funeral that I thought we would have been planning 8 years ago. I encourage you all, when you go home to your loved ones today, hug them. I wish I would have hugged my mom just one more time when she headed to get her PET scan, but I didn’t. I thought I’d see her in a couple hours when she got back. That never happened. Hug your parents, your spouse, your siblings, your child, or friend while you can. Could be, two hours from now you won’t have that chance. RUSHVILLE, Ohio -- John Clum is sold on work. At 90, he is thought to be Ohio's oldest active auctioneer, although the state doesn't track the ages of its 3,300 licensed practitioners. "I don't know of anyone older," said Lori Landry, executive director of the Ohio Auctioneers Association, a trade group. Auctioneering is about the seventh career for Clum, who got his first license in 1978 after stints as a truck driver, an airplane builder, a road worker, a soldier and a few other things. These days, he works part time out of his son's Rushville auction house, Mike Clum Inc. Retirement is not a word that rolls off the smooth talker's tongue. "I'm on the lazy side, but you've got to keep moving," he said. "I keep coming around because you get to meet so many nice people." Mike Clum Inc., located 40 miles southeast of Columbus, hosts monthly auctions in a converted log barn that are frequented by antiques and collectibles dealers from Ohio and neighboring states. Another senior employee is Jane Clum, 87, who married John 65 years ago and remains his biggest fan. "I think he does a great job," said Jane, whose job is to record who buys what and for how much. "Well," her husband answered, "I've had a lot of practice." For someone who talks for a living, Clum is a man of few words. Asked what makes an auctioneer successful, he boils it down: "Have a big mouth." What about tricks of the trade? "You just do it, that's all." Secrets to a long marriage? Strangest thing he ever sold? 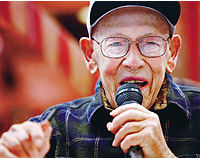 He speaks more freely from behind the microphone at the auctioneer's table. His voice doesn't have the punch it once had, but Clum can still move the merchandise. "Five is the bid; 10, give me 10," he speaks in rapid-fire succession, selling antique toothpick holders to 50 dealers. "Seven and a half, 15, now 17 and a half? Sold for $15." His son gives him grief for being unable to read the number on a winning bidder's card. "When you turn 100, we'll put up with excuses," Mike says. "But 90, no." Antiques dealer Mike Dixon of Westerville, a customer for 30 years, said the friendly atmosphere and good-natured ribbing add to the auction house's charm. "It's a great place and a real family affair," he said. West Liberty dealer Richard Johnson, 86, called Clum an inspiration. "He's a little slower than he used to be, but he does pretty good." John Clum said he wants to work 20 more years. A Republican, he even jokes about running for public office or being appointed to President Obama's cabinet. "Heck, I've got my taxes paid."